On some days, most as a matter of fact, where a prompt is given it is sort of perfect. 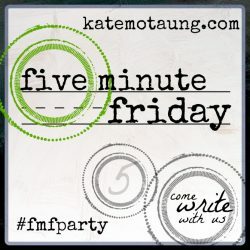 Today’s prompt: Five, is the perfect prompt for FMF. To join in: click the icon. Five – the number of times I wish my kids would limit their nagging questions. You know, instead of 5,000. 5,000 – the number of times I wish I could say no BEFORE blowing my top. You know, instead of Five. Five – the number of people in this house yesterday that believed they were in charge. You know, instead of the ONE that actually is in charge. Five – the number of times I asked myself “what were they thinking?” yesterday. You know, because thinking didn’t really seem to be a “thing” yesterday. Five (times 2 really) – the number of times I got smacked upside the head by God yesterday. You know, because “what were you thinking?” was asked by Him yesterday too. Five – the number of bible verses that were not so gently put right in front of me as I struggled. You know, accompanied by those smacks upside the head. One before and one after, just to make sure I got the point. Five – the time I woke this morning. You know, instead of sleeping until my six o’clock alarm. Five – the Hail Marys said before getting out of bed. 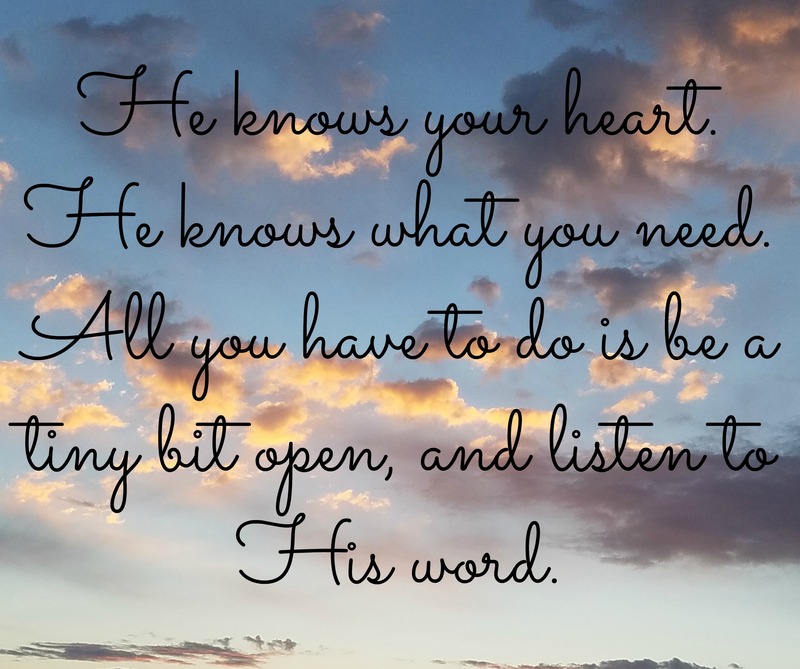 You know, to ask for wisdom, grace, acceptance, patience, and peace. Five – the number of times I said “thank you” this morning. You know, for the blessings I have been given. Five – the number of hours I worried over other people’s issues. You know, instead of the five minutes it deserved. Five – the number of minutes I’ve taken to sort this out in my head. You know, so I can be a mom and go do the good things I’m supposed to do today. Sometimes it all comes out a jumbled mess. Regardless of the sense it makes to others, it is amazing how much it helps. Stop worrying over other people’s issues. When you mess up, rub the knots on your head from the God smacks, pray, listen, and go on. For nothing will be impossible with God.” Then Mary said, “Here am I, the servant of the Lord; let it be with me according to your word.” Then the angel departed from her. “Do not worry, my sister; he will return safe and sound, and your eyes will see him. Previous PostWhere is my path leading me? All the way to happy! I love your to-do list. 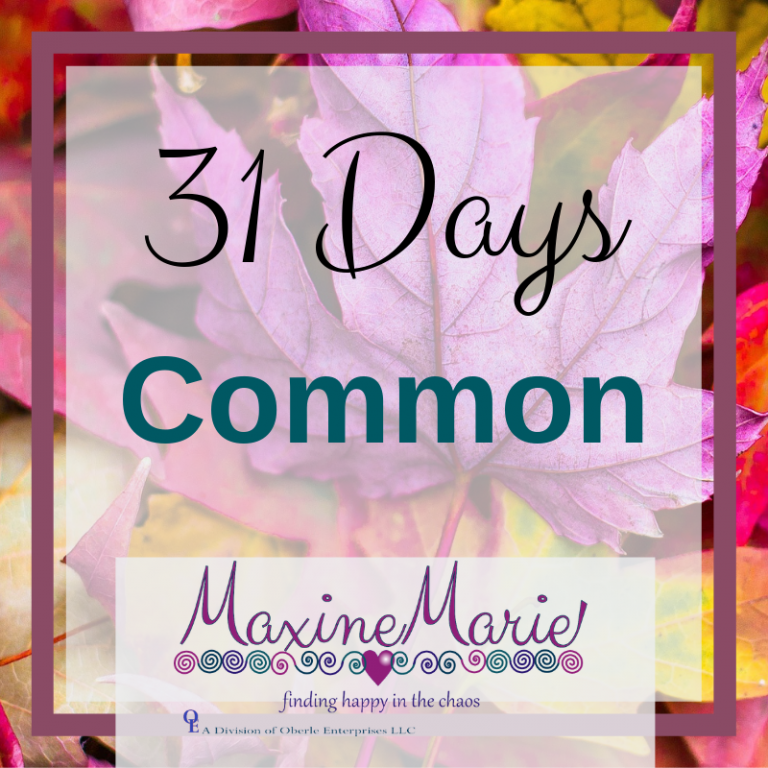 Sometimes it can be so easy to focus on the “to-don’ts” that I lose sight during the day of keeping my eye on the prize. Visiting from FMF#23. I love this. I found myself smiling at your format and completely agreeing with every statement. I hope you have a great day. Maxine, this so made me smile today. I don’t think I’ve met you before, but I love how playful you can be while also being profound. So enjoyable!